Skiers and riders may love the natural beauty of the great outdoors, but most snowsports enthusiasts rely on high tech equipment these days to enjoy it. After all, virtually no one still skis on solid wood planks with leather straps. Surely many skiers and riders received shiny new iPhones or Androids for the holidays and are looking to put those new toys to use. Smartphones have become so common on the slopes that mobile app makers have lined up to create ski-related offerings. Below is a listing of the best apps on the market to enhance your day on the mountain. Starting close to home here at OnTheSnow.com, this FREE app found the spotlight a few years ago in one of the memorable “There’s an app for that” Apple iPhone commercials. Android was still in its infancy at the time, but now the Ski & Snow Report also has an Android version. The app provides a basic, but essential, function by giving snow and weather reports for thousands of ski areas. Users can even set up powder alerts for their favorite resorts. The first version of this FREE app was introduced prior to last ski season and has been updated and improved for this season. The Gear Guide gives the lowdown on more than 200 varieties of skis, snowboards and boots. The filtering process on the app can’t replace a personal real-world product test, but it can definitely narrow the choices to demo. SnoCru calls itself the first “micro-social app for the entire snowsports industry.” While the FREE app gives basic resort snow conditions, the ability to track friends’ locations on the mountain in real-time adds the social element. A real-time chat function also helps coordinate plans on the slopes or even for après gatherings. As might be expected for a socially-focused app, SnoCru includes an easy way to tweet or update Facebook status. For showing off to friends, the tracking feature records an individual’s speed, distance, vertical, altitude and even slope angle. Value-conscious skiers and riders already know Liftopia, an online source for discounted lift tickets at more than 150 resorts. Very few, however, could give the official full name for the company’s brand-new FREE app. “Liftopia Ski Reports, Snow Conditions and Ultimate Lift Ticket Deal Engine for iPhone and iPod touch” doesn’t exactly roll off the tongue, but it is a comprehensive description. Users can buy lift tickets directly from the app or from Liftopia’s website that is synced to the app. Either way, the iPhone’s screen provides an easy tool for showing a receipt at the ticket window, rather than having to print out a paper voucher. While the “There’s an app for that” Apple commercial got the ball rolling for snowsports apps, EpicMix has emerged as one of the biggest kids on the block since it was introduced last season. Created by Vail Resorts, the FREE mobile apps for iPhone and Android are just one part of an extensive program at the company’s six resorts: [R482R, Vail], [R36R, Beaver Creek], [R77R, Breckenridge], [R197R, Keystone], [R299R, Northstar California] and [R169R, Heavenly]. Using the radio-frequency (RF) chips embedded in lift tickets/season passes and scanners at the lifts, the system tracks users’ activities and allows them to share on Twitter and Facebook. Various accomplishments earn “virtual pins” for bragging rights. New for this season, professional on-mountain photographers will take guests’ pictures for free and deliver them to EpicMix accounts for sharing. AlpineReplay has many of the same features and social virtual awards as EpicMix, but the FREE apps work on mountains beyond those owned by Vail Resorts. Using the phone’s GPS, rather than RF-lift tickets as with EpicMix, AlpineReplay can provide data such as speed and even airtime. The name AlpineReplay fits, because it can generate a 3-D computer-animated replay of a user’s run. Combining computer animation and reality, this app features augmented reality or just “AR” as techies would say. For example, by holding the phone up to peer at the terrain, virtual trail signs pop up on the screen in the appropriate spots. The app itself is FREE, but the mapping for each one of about 100 available North American resorts costs 99 cents. 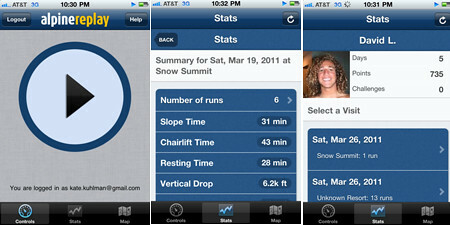 Many of the larger ski resorts have developed their own FREE apps. These usually offer a lot of the same tracking and snow report features as the general apps. By targeting just one resort, however, an app such as JH Tapped for [R191R, Jackson Hole Mountain Resort] can provide even more extensive local information. Real-time lift status, web cams and a comprehensive contact list for base area businesses are generally included in resort apps. [R25R, Aspen/Snowmass],[R227R, Mammoth Mountain], [R314R, Park City Mountain Resort], [R395R, Smugglers’ Notch], [R489R, Waterville Valley] and [R493R, Whistler Blackcomb] are among the numerous North American resorts with specific apps for iPhone, Android or both.